I have mentioned in the past that I have tried this flavor, but it was on sale this week, so I bought my wife a fresh container with thoughts of giving it a second scoop review. 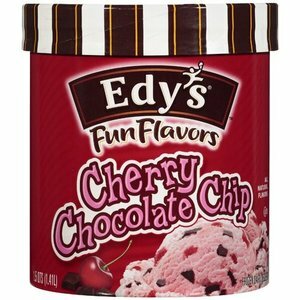 Now, the cherry chunks are bothering me, but overall, this is a respectable ice cream. The cherry ice cream is fairly mild in flavor, but has a very pleasant fluffy texture to it. Wait, oh geez, it's another flavor they are calling a "frozen dairy dessert". I may have to change the blog name if this keeps up. Anyway, that explains the texture, and in this case, I think it works for the cherry flavor. The chocolate chips are average and don't really add much, expect maybe some crunch. To be honest, I think I'm actually enjoying it a little bit ...while I'm avoid the cherry chunks anyway. So, if you love cherries, check this out, otherwise, well, it's up to you!